Fall in love with Costa Alegre beauty and its charming sunsets. The wonderful habitat corridor of Costa Alegre is located between the Port of Manzanillo, Colima, and Puerto Vallarta, Jalisco. It is a rich coastline comprised of a harmonious collection of beaches that meet at a specific point in nature. Costa Alegre is an extravagant place that is distinguished by its beauty, charming sunsets, warm, deserted beaches, and endless amusement. To know this location is to enjoy ceaseless emotions that transport you to the best vacation experience, where you will deeply fall in love with Costa Alegre. The municipalities of Cihuatlán, La Huerta, Tomatlán, and Cabo Corrientes, and their coastlines: Barra de Navidad, Bahía Tenacatita, Costa Careyes, Bahía de Chamela, Costa Majahuas, and Cabo Corrientes range over 160 kilometers. Each of them possesses magnificent charm and attractiveness that gives its beaches unexplored tranquility, immense vegetation, spectacular cliffs, coves and smooth swells, mysterious mangroves, and extensive tropical jungle zones. It is a place of cultivation, and home to a wide variety of flora and fauna with the traditional and picturesque touch that characterizes the communities of Jalisco. Inside this wonderful place, the Sierra de Manantlán Biosphere Reserve is located. Its 139 thousand hectares offers a magical refuge for 2,700 species of plants among nine different types of vegetation; there are more than 560 species of invertebrates, many of which are in danger of extinction, and fifty percent of them are unique in our country. One of the outstanding places of Costa Alegre is, undoubtedly, Barra de Navidad, a paradise that offers tourists the possibility of amusement through the sport-fishing of sailfish and marlin. 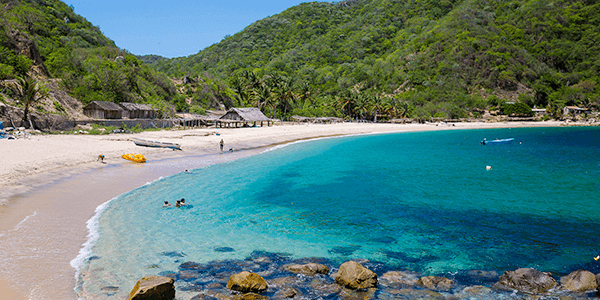 Bahía de Chamela, respectively, is comprised of over nine islets, great for ecotourism aficionados. Be one more fisherman and enjoy the fresh cuisine of shrimp, octopus, and clams by the seashore. Bury your feet in the sand and delight yourself in a delicious cocktail with fresh ingredients, which will leave you feeling fantastic. Costa Alegre promises an alluring and enjoyable vacation in one of the most beautiful areas of the Mexican Republic.